The United Nations has demanded an immediate investigation into an attack by an American warplane that killed nine children playing in the compound of a house in southern Afghanistan. The Afghan President, Hamid Karzai, who faces growing dissatisfaction over the return of the Taliban as well as the number of civilian casualties caused by the United States, has expressed concern over the raid. The American military claims a former Taliban militant, Mullah Wazir, who had boasted of attacking aid workers, was killed in the attack on the town of Makur, near Ghazni. Afghan officials in Ghazni said Mr Wazir had not been at the building during the raid. Haji Assadullah, the governor of Ghazni province and an ally of Mr Karzai's American-sponsored interim government, said: "It has not been ascertained if Mullah Wazir was killed or not, although the property did belong to him." The UN expressed its "profound distress" at the attack. It warned that the deaths would aggravate tensions in southern Afghanistan where there has been an increase in the number of attacks on US and Afghan government forces. "A systematic independent study has been carried out into civilian casualties in Afghanistan by Marc Herold, a US economics professor at the University of New Hampshire. Based on corroborated reports from aid agencies, the UN, eyewitnesses, TV stations, newspapers and news agencies around the world, Herold estimates that at least 3,767 civilians were killed by US bombs between October 7 and December 10. That is an average of 62 innocent deaths a day - and an even higher figure than the 3,234 now thought to have been killed in New York and Washington on September 11." Lakhdar Brahimi, the UN special envoy for Afghanistan, called for a swift inquiry into the deaths and for the outcome to be made public. He said: "This incident adds to a sense of insecurity and fear." A US military spokesman, Lieutenant-Colonel Bryan Hilferty, said the loss of innocent lives was "regretted" and that "the tragic incident" was being investigated. He said US soldiers found the bodies of nine children as well as that of a man, who was the intended target. The military added that US and allied forces in Afghanistan "follow stringent rules of engagement to specifically avoid this type of incident while continuing to target terrorists. The operation took place after extensive intelligence over an extended period of time." Zalmay Khalilzad, the American ambassador to Afghanistan, said Mr Wazir had been "a known financier, organiser and facilitator of terrorist activity" involved in attacks on aid workers as well as on Afghans working on the Kabul to Kandahar highway. Soon after the children's deaths became public, suspected Taliban gunmen kidnapped two Indians working on a US-funded road in the neighbouring Zabul province and two Turks working on a well-digging project near Kabul. A bomb was detonated in the southern city of Kandahar injuring at least 18 people. The incident comes at a sensitive time. The country's constitutional loya jirga, a national meeting to set up the framework for next year's election, starts in Kabul this week. "A Guardian report in February estimated these casualties at between 1,300 and 8,000 deaths. A Guardian investigation into the "indirect victims" now confirms the belief of many aid agencies that they exceeded the number who died of direct hits. As many as 20,000 Afghans may have lost their lives as an indirect consequence of the US intervention. They too belong in any tally of the dead." Donald Rumsfeld, the US Defence Secretary, met Mr Karzai last week to discuss the increase in attacks by the Taliban. Mr Rumsfeld said that he wanted to emulate a highly successful mission by a British-led provincial reconstruction team that persuaded one of the country's most powerful warlords, Abdul Rashid Dostum, to disarm his militia. But such initiatives would be made more difficult by the weekend's deaths following other killings by "friendly fire''. 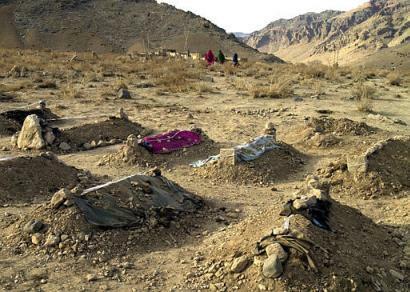 In November, six civilians were killed in an air strike in the southern province of Paktika, and three weeks before that eight members of the same family died in an attack in the province of Nuristan. In July last year, the Afghan government said 48 people had been killed and 117 hurt when an American gunship attacked a wedding party.